As Accidental Pren-hers, we often find ourselves asking a lot of questions about who we are, where we are going, and how we are going to get there. It's only natural when making the transition from a more traditional work style to an entrepreneurial lifestyle that the big questions of life pop up. Here is a question one of my clients recently asked: "What do you do for yourself when you need to find clarity in the big questions of life?" What a great question! Can't you all relate to that question? I know I sure could! Assume that you already know the answer. Affirm that you already know the answer. Cop an attitude of gratitude. Ask: is this in my highest good and greatest well being, right now. 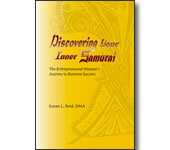 Then listen/feel for the "yes" or "no" pulse of your Inner Samurai. Lastly, stay unattached to outcome, knowing that all is well. Then follow that all up with the phrase: I will no longer let someone/some thought get in the way of my happiness. I open my fist and let this person/thought go, knowing that all is well in the world and the Universe is conspiring for my greatest good. Repeat as many times as necessary to quiet the voice inside your head and let your Inner Samurai come forth. So what do you think about these 8 steps? Have you tried them out? How did they work for you? Click the comment button below and let us know!